There are certainly numerous good reasons to keep your volume down while you’re up on stage, but two stand out: firstly, the need to protect your ears (not to mention the ears of your bandmates and the audience! ), and secondly, the fact that you and your fellow musicians have to be able to hear each other while you’re doing your thing. No doubt about it, a deafening guitar rig is not going to help anybody. Thankfully, there are a few solutions to this. You could try going down the non-tube amp route, for example. Digital modelers don’t need to be turned up to sound their best. But then, their best is a sacrifice when compared to genuine tube tone. 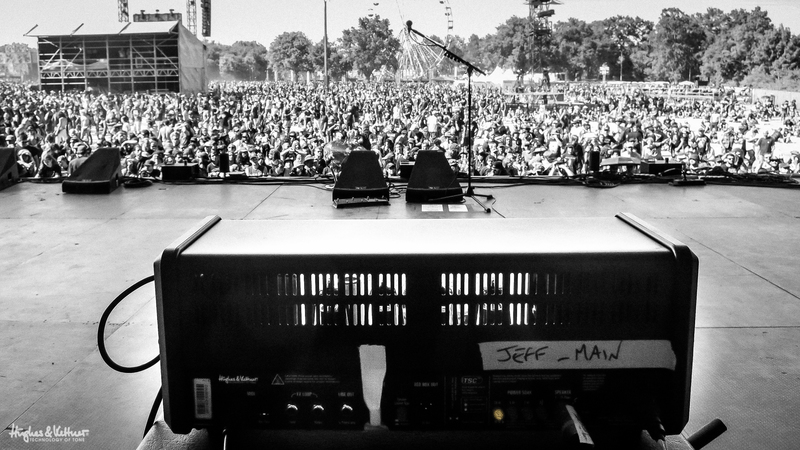 You could try experimenting with the position and angle of your amp on the stage – more on that here. Or, you could play an amp with a master volume, or just turn the volume down on your amp if you don’t have the master option. Works OK, but again, most tube amps sing when they’re cranked, and for that, there’s only one workable solution: deafness. Oh yes, or the power soak. So, what is this power soak feature, and how does it help you as a live guitar player? Big stage? Sure. Loud amp needed? Not at all! Read on to find out exactly why. And yes, this even applies to loud bands who play loud genres like metal and thrash – this pic was taken shortly before Annihilator took the stage at the Hellfest in France. Well, first off, you’ll find it on the TubeMeister and GrandMeister amps, and what it does is allow you to enjoy the benefits of full-blown power amp saturation – and therefore the most delicious guitar tones imaginable – at low volumes (which, by the way, also makes it perfect for you to play at home without annoying the neighbors too much – more on exactly that here). 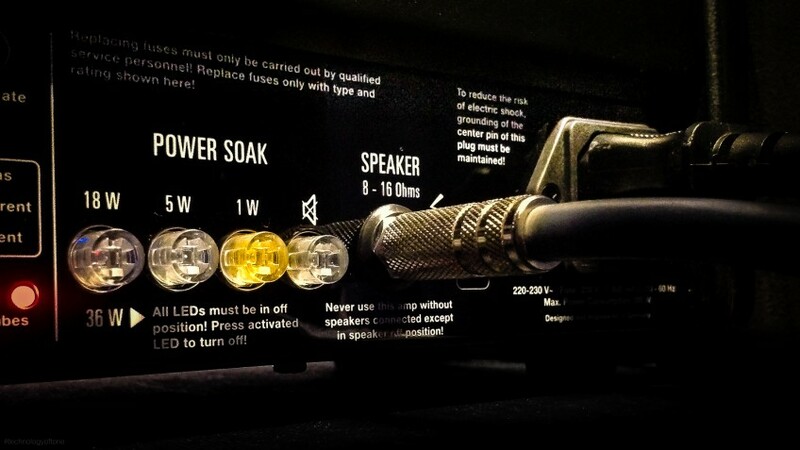 On the GrandMeister and the TubeMeister 36 (both of which pump out 36 watts in full power mode) the power soak works by first disabling two tubes to reduce the output power by half – to a still pretty rocking 18 watts. 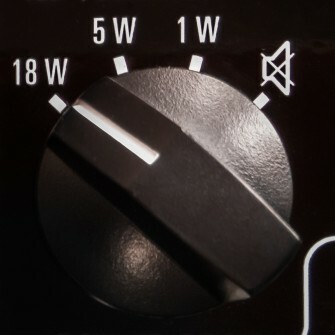 When you press the 5W and 1W buttons, some of the power is converted into heat to further reduce the output to five watts and one watt respectively. On the 18-watt TubeMeister 18, the power soak converts power into heat, giving you the same five, one and 0-watt modes of its bigger brothers. When you’re playing a show, this can be a true blessing. Don’t just take our word for it, though – a number of pro players are using the power soak at big gigs to help them, their bands and their audiences enjoy an improved live experience. So, if you’re in the position where your tube tones are simply too loud – be in on stage, or at home – you know what to do: give the power soak a try. First published: October 30 2015. Most recent update: October 30 2015.
have an early switchblade stack.100watts is now too loud,can 1 fit some sort of power soak to this amp,without mikes. Speaking about volume, my source audio expression pedal does not control the volume via the midi footswitch the way its supposed to. It only ranges from 70-100 volume, nonsense of that sort goes for every single parameter as well. Am I supposed to use a specific expression pedal or is it the amp that has the problem? The next thing to try would be to ask Source Audio if they’ve got any resolution for this. We’ve not tried that sepcific pedal, so we’re unsure of how it acts exactly together with the GrandMeister! Great blog, I always wondered if there was a decent way of doing this. Now I know 😉 Also loved the loooong explanation blog too – can’t wait to try one of those H&K amps out with the Power Soak soon!!! Thanks for the kind words Jerry! We prefer the word ‘detailed’ to ‘looong’ but there you go – at least it was useful 😉 Enjoy the power soak when you try one, and let us know how you get on with it!